Remember to post a #MustReadin2019 update this coming Thursday with Carrie Gelson at There's A Book for That! Jama Rattigan at Jama's Alphabet Soup shares a roundup of all the Kidlitosphere's goals for poetry month, several that share wonderful ideas for the classroom! For older young adults and adults, my review for this book is on Goodreads here. It's a tragic and fascinating story, deeply researched. Thanks to Candlewick Press for these next three books! From England, first published in the U.S. this year, a fun illustrated chapter book for younger readers by Meg Rosoff. The Peachey family is in trouble. Mom has retired, yes, retired! She has tired of doing ALL the work and has begun to study yoga instead. And the father and three children are lost. The house is in shambles: clothes are not clean and sometimes not found, no one is cooking and frozen meals are their last resort. The youngest, Betty, decides that they need a dog. You might think that's not what they need, but sweet adopted dog McTavish saves the day with Plan A, Plan B, and Plan C. Readers will find some lessons about cooperation in the story, maybe even for the classroom, too. 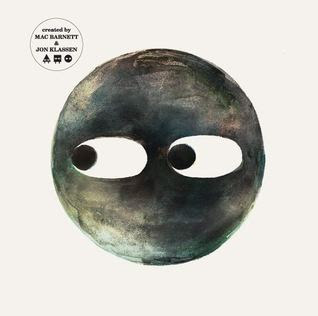 All one needs is Jon Klassen's clever use of eyes, along with Mac Barnett's succinct use of words to start the story, and in this final "shapes" trilogy, one is hooked. Circle is playing hide and seek with Square and Triangle. This time, the game is hide 'n seek, and Circle sets the rules: Do not hide behind the waterfall. Yes, a waterfall is there, in a lake or ocean setting and Circle claims it's too dark. Triangle declares he's not afraid of the dark and breaks the rules, hides behind the waterfall. Good friend Circle doesn't like it but goes to save Triangle. What happens there in the "almost" dark, then darker, then "darkest" dark is a surprise, but you might guess if you watch those eyes, eyes that become three sets instead of two. Imagination can frighten or delight. This will make a marvelous read aloud, and call for lots of wondering! "For all who dare escape this ball of clay. these brave ascending angels light the way." Endnotes include additional notes on the poems, a glossary of selected space terms, internet resources, and acknowledgments. 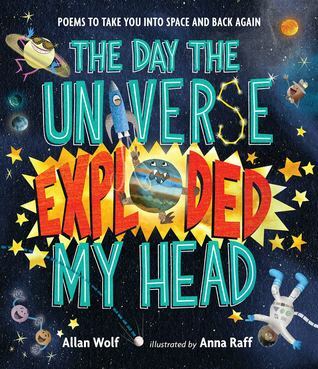 The book holds an incredible amount of space knowledge in clever, non-fiction poems. And I'm happy to share other beautiful recent books, too! Carmela is finally old enough to tag along on chores with her big brother, who is grumpy about it. But he does tell her she can have a wish on a dandelion puff she finds. Her jangling bracelets and that dandelion puff keep her imagining all the wishes she could wish, and those wishes tell readers why these two are doing the errands. Mother is a housekeeper; Father is a day laborer and one wish is for him to get his papers so he can be home, a poignant showing of some children's struggles. They're doing family work! All is so happy till she hits a bump with her scooter and goes flying, as do all her wishes! No matter the earlier frowning, maybe embarrassment, brother love saves the day. You'll love the end and the wonderfully happy, beautifully painted illustrations by Christian Robinson (also Matt de la Pena's collaborator on their Newbery and Caldecott medal winner, Last Stop on Market Street. And another young girl becomes five, and old enough to carry milk down into the valley to a neighbor. Set during World War II, the fathers are gone, and mothers must carry on. In the author's note, Kerry Madden-Lunsford shares that the story's base is from a friend's story of growing up in Maggie Valley, North Carolina where neighbor helped neighbor when needed. The story is fiction, but the charm lies in the young girl Ernestine's bravery as she navigates the journey with a big imagination and two jars of milk from their cow through thickets of blackberry and crabapple, hearing a rustling and thinking it could be a lone wolf in addition to other scary sounds. What happens when one jar spills from the bag and rolls down a hill, lost forever, is a nice surprise. 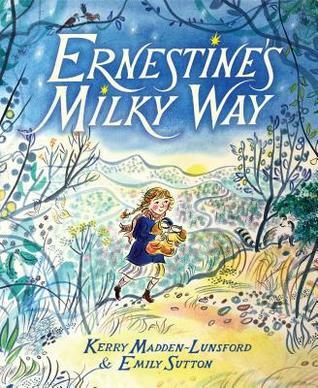 Emily Sutton's bright watercolor illustrations of the scene and Ernestine's emotions brighten the sweet story as she keeps her courage by saying, sometimes shouting: "I'm five years old and I'm a big girl!" After the author's note, there is also a recipe for cornbread! Wow! These next two books out recently are both by Pat Zietlow Miller. 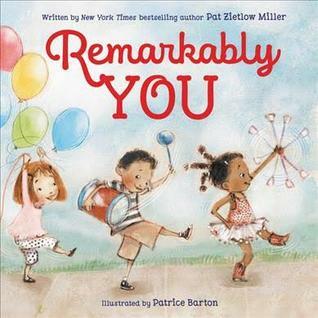 This book inspires each one to set the world on fire, being "remarkably you"! Busy, happy children do all kinds of things that they love, having fun inventing and building, gardening and volunteering. 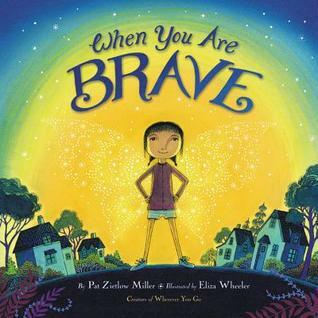 Many kids will see themselves on these pages illustrated by Patrice Barton as they listen to or read the poetic text by Miller. End covers include some of the children, too! book is? The brief descriptions of scared feelings and the how-to find courage need nothing more than to be shared. Following this young girl as she leaves her home and says goodbye, moving to "what?" can be frightening, yet as the hours go, Pat Zietlow Miller fills the pages with the way to find one's courage and Eliza Wheeler's illustrations show the feelings in big and bold paintings. Imagining the finding of courage means the searching for that tiny light, hidden, but Miller writes: "If you close your eyes and/breathe, you will see it–/shining its light in the dark./Warm. Steady. Safe." She suggests that it can be turned into a flame, and offers a few ways to do that, too. I won't quote all, though it's tempting, but it's empowering. I imagine it will start so much great conversation with kids, or groups of kids, adults, too! I agree, all are marvelous, Irene. Happy that you love them, too! Thanks! The only book from this week's list that I've read is Carmela Full of Wishes, so I need to see which of these I can slip into my list. LOL Also, I'm so happy you shared Killers of the Flower Moon, Linda! I am very intrigued by this book. I added it to my list back in February, but I really need to bump it up. I believe this is where my husband's grandfather was born. He always referred to it as "Indian Nation" in Oklahoma. They lost his birth certificate and it was very difficult to find proof of his native ancestry (his daughter tried very hard before he passed away). We were told that much of the data from around the time he was born (I believe he was born in 1920) was lost or destroyed. Anyway, I imagine it will be a fascinating read, especially with our family history! There's always more for the list, especially after Monday, right? I love that you're following connections of your husband's grandfather, wish you some resolution some day! The book is tough to read, but I'm glad to know, too. No one wrote of this history for our history books, sad to say. Thanks Shaye, enjoy the books you can! Yes, there are so many! And yes, Barton's children are adorable! Hope you can find and read the book soon. Thanks, Jane! I read and appreciated you review of Killers of the Flower Moon. It's not an easy one, but so important. These picture books are all so wonderful. 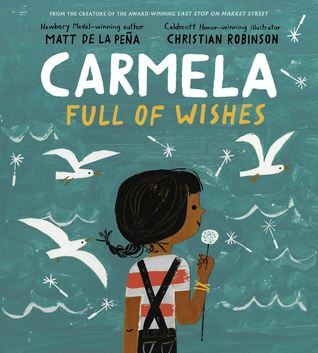 I loved Carmela Full of Wishes and will be looking forward to When You are Brave. 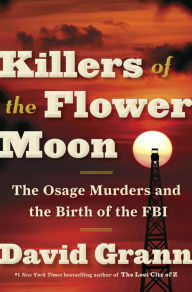 I enjoyed Killers of the Flower Moon, though it is heartbreaking to know of the consistent cover-ups that occurred and that we never hear of this in news or our history books. Enjoy When You Are Brave, one to cherish. Thanks, Cheriee! Carmela Full of Wishes looks like an awesome book! I'm definitely going to have to get to the library and find it. Thanks for sharing! It is very sweet, Jana. Hope you like it, too! Thanks! Miller's books sound so inspirational! I adored Carmela Full of Wishes! So many of my recent reads are on your list this week! I am a big fan of Pat Miller's books. They really are uplifting! 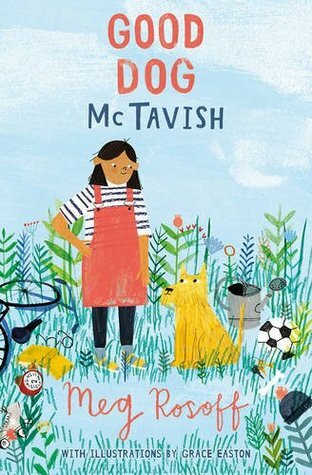 Good Dog Mctavish is a good title for me so I immediately put it on hold at my local library. Have a great week! Thanks, Laura, glad you found a book new to you! I. Need. Circle! WE love the other books in the series, so we must get this one! Thanks, Kellee, yes, the series & this final one are terrific! Love all of these picture books you shared Linda! When You are Brave looks particularly charming. Each one is one to savor, Carrie, and When You Are Brave is really special. Thanks! Yes, When You Are Brave will be perfect for that, Myra! I read it to Ingrid, 4th grade, & we had so much to talk about during and after. Enjoy Killers of The Flower Moon when you can. Thanks!